Uses infrared sensors to detect heat and increased vascularity (angiogenesis) as the byproduct of biochemical reactions. The heat is compiled into an image for computerized analysis. High frequency sound waves are bounced off the breast tissue and collected as an echo to produce an image. Passes radiation through the breast to produce an image. Suspicious areas need to be dense enough to be seen. Can be used as often as indicated to trace a problem, observe the effectiveness of treatment, or monitor the health of the breast over time. Very limited use due to radiation exposure and pain concerns​. Functional imaging. Detects physiologic changes. Cannot pinpoint the exact area of suspicion inside the breast. Structural imaging. Ability to locate the area of suspicious tissue. Non-contact. Nothing touches the breasts. Uses mild sound head contact Compresses the breast. Earliest method of breast cancer detection known. Not a screening procedure. Used to investigate an area already detected by mammography, thermography, or physical examination. Low spatial resolution (cannot see fine detail). Good at distinguishing solid masses from fluid filled cysts. Can detect cancer earlier than physical examination. Findings increase suspicion. Cannot diagnose cancer. Findings increase suspicion. Cannot diagnose cancer. Findings increase suspicion. Cannot diagnose cancer. Can detect a pathologic state of the breast up to 10 years before a cancerous tumor is found by any other method. Ability to detect some cancers missed by mammography. Can detect tumors in the pre-invasive stage in mainly slow-growing cancers. Has the ability to detect fast growing aggressive tumors. In 7 out of 10 women, thermography will be the first alarm that something is happening. 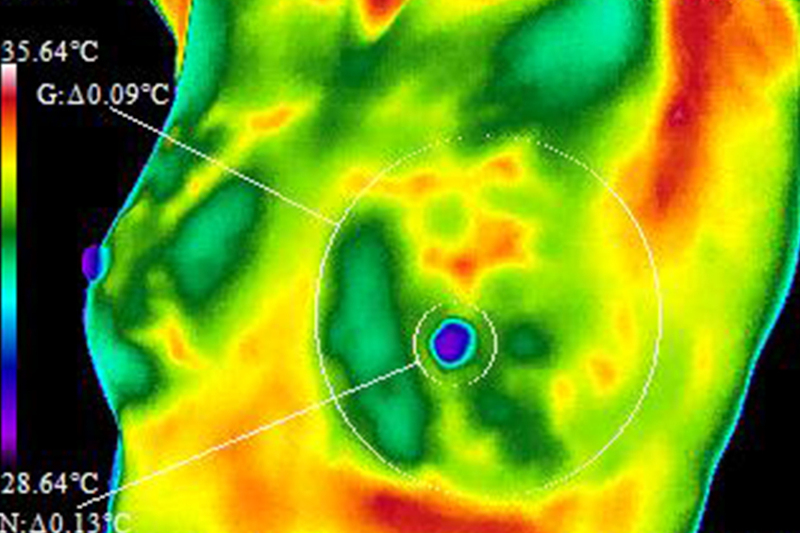 ​A positive infrared image represents the highest known risk factor for the existence of or future development of breast cancer – 10 times more significant than any family history of the disease. Cannot detect exponentially fast growing tumors in the pre-invasive stage. Average 90% Sensitivity (10% of cancers missed) in all age groups. Of these missed cancers, the vast majority are slow growing and poorly invasive. Of the type of cancers to miss, this is highly preferable. This makes thermography highly valuable as a prognostic indicator. Average 83% Sensitivity (17% of cancers missed) in all age groups. Average 80% Sensitivity (20% of cancers missed), in women over age 50. Sensitivity drops to 60% (40% of cancers missed) in women under age 50. Hormone use – no effect No known effect Hormone use decreases sensitivity. Large, dense, and fibrocystic breasts – no effect Large, dense, and fibrocystic breasts – no known effect Large, dense, and fibrocystic breasts cause reading difficulties. Not applicable. Due to the nature of infrared imaging, pre-cancerous and cancerous tumors as deep as the chest wall can be detected. All areas visualized In most women, the medial upper triangle, peripheral areas next to the chest wall, and the inframammary sulcus cannot be visualized. Uses infrared sensors to detect heat and increased vascularity (angiogenesis) as the byproduct of biochemical reactions. The heat is compiled into an image for computerized analysis. Non-contact. Nothing touches the breasts. Earliest method of breast cancer detection known. Findings increase suspicion. Cannot diagnose cancer. 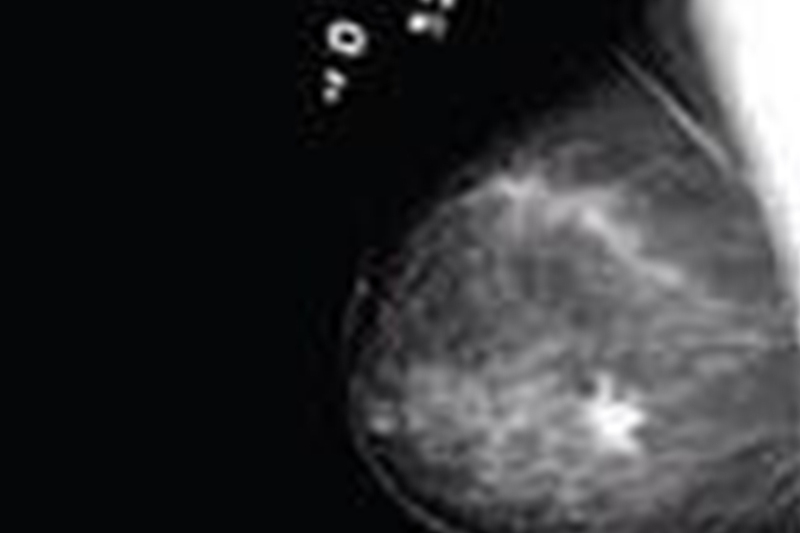 Can detect a pathologic state of the breast up to 10 years before a cancerous tumor is found by any other method. Average 90% Sensitivity (10% of cancers missed) in all age groups. Of these missed cancers, the vast majority are slow growing and poorly invasive. Of the type of cancers to miss, this is highly preferable. This makes thermography highly valuable as a prognostic indicator. Average 90% Specificity (10% false-positives). Due to thermography’s ability to act as the earliest warning signal, further studies are needed to follow patients over a prolonged time period. Not applicable. Due to the nature of infrared imaging, pre-cancerous and cancerous tumors as deep as the chest wall can be detected. High frequency sound waves are bounced off the breast tissue and collected as an echo to produce an image. Not a screening procedure. Used to investigate an area already detected by mammography, thermography, or physical examination. Low spatial resolution (cannot see fine detail). Good at distinguishing solid masses from fluid filled cysts. Ability to detect some cancers missed by mammography. Average 83% Sensitivity (17% of cancers missed) in all age groups. Average 66% Specificity (34% false -positives). Passes radiation through the breast to produce an image. Suspicious areas need to be dense enough to be seen. Can detect tumors in the pre-invasive stage in mainly slow-growing cancers. Average 80% Sensitivity (20% of cancers missed), in women over age 50. Sensitivity drops to 60% (40% of cancers missed) in women under age 50. Large, dense, and fibrocystic breasts cause reading difficulties. 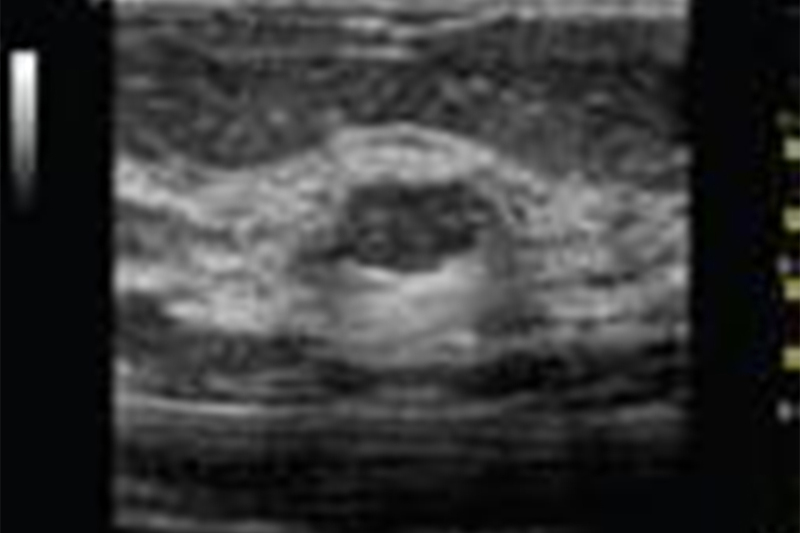 In most women, the medial upper triangle, peripheral areas next to the chest wall, and the inframammary sulcus cannot be visualized. If you haven’t heard of breast thermography, it’s because this proven technology has been thwarted by the multi-billion dollar American mammography industry. For over 30 years, it has conducted a successful campaign that has suppressed this life saving technology – at the expense of American women. Breast thermography’s outstanding accuracy is proven, while mammography’s screening failure and drawbacks are widely known. But, mammography is still promoted while breast thermography is discouraged. Explanation: It’s all about money! A financial empire has developed around mammography screening. In fact, if every woman were to follow American Cancer Society’s guidelines for mammography screening, the annual revenue to the mammography industry would exceed $6 billion. Reputable medical professionals have repeatedly reported in the most respected medical journals that mammography screening to detect early breast cancers is inaccurate, ineffective, and its X-rays are harmful to a woman’s health. The benefits are minimal, at best, but the hazard to women’s health is enormous. In fact, since mammography screening was introduced in the early 1970’s, the incidence of ductal carcinoma in situ has increased by 328%, of which 200% is due to mammography. ​– 2003 issue of AMA journal, American Medical News. So then why is mammography so supported and repeatedly prescribed by physicians while no one is talking about the benefits of thermography? ?